To illustrate the challenges and the migration process, let’s use an overly simplified customization that displays a button that users can click to display a greeting. The code of the customization is embedded on the page using the Script Editor Web Part. 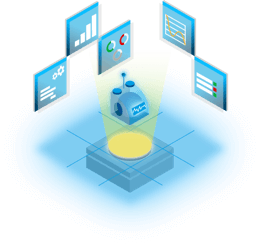 Once the project is created, you start by adding the existing code file to the project without any further modifications. Then, you replace the HTML block in the web part’s domElement with the HTML of your customization. In order to load the contents of the code file, you add the require('./my-script.js') statement to the web part’s render method. So why isn’t it just working as it used to in the Script Editor Web Part? When you referenced script in a Script Editor Web Part that script was loaded in the global scope of the page. 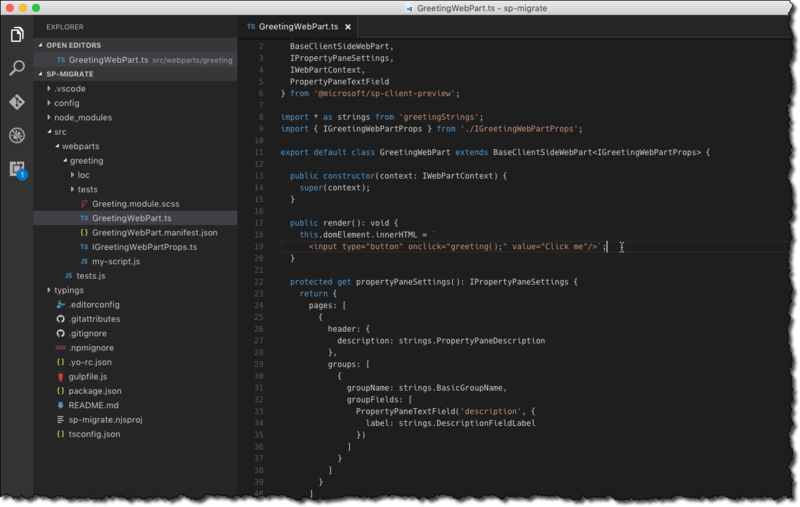 Every variable you defined was by default assigned to the top-level window object. While things just worked and you didn’t have to worry about anything, there was the occasional risk of different elements on the page colliding due to using the same variable names. Although you included your script without any further modifications, it’s not how it’s loaded in the web part. 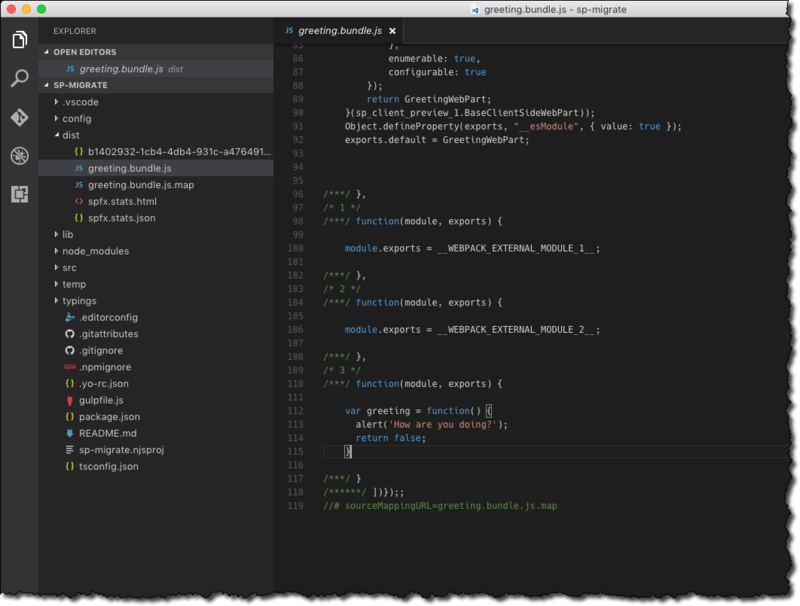 You can see it by analyzing the contents of the generated bundle file in the project dist folder. Your previously globally-scoped function is now a local variable inside a function which is exactly what makes it inaccessible outside of this function. So how do you solve this? 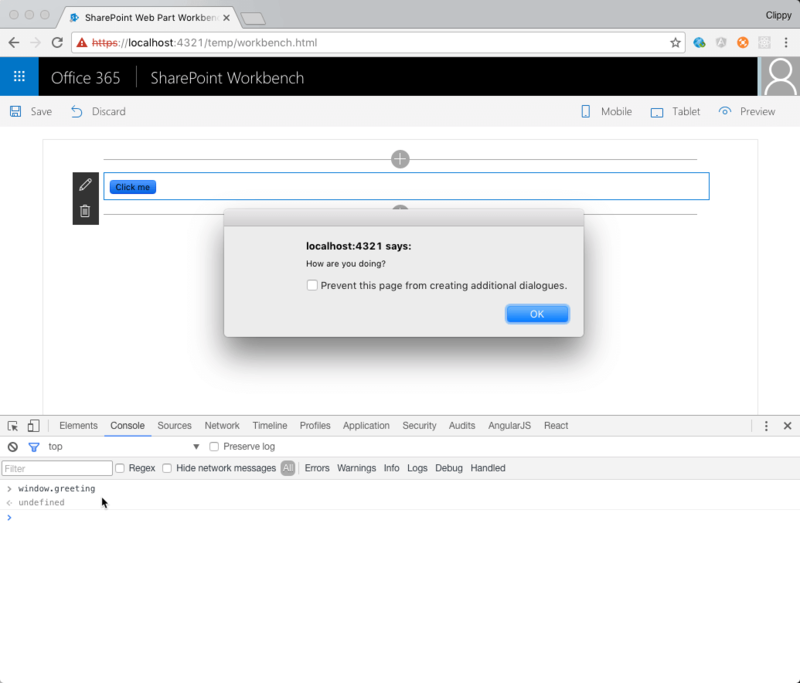 When migrating your existing SharePoint customizations to the SharePoint Framework, ideally you would rewrite them to make the best use of the capabilities that SharePoint Framework has to offer. As you can imagine, it wouldn’t however be a trivial task, depending on the complexity of your customization. 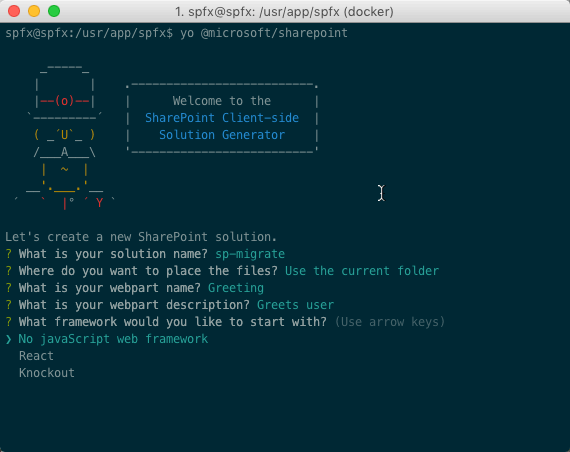 There are a few other ways in which you can wrap your existing customizations into SharePoint Framework client-side web parts with considerably less effort. This is a relatively simple tweak that makes your code work, exactly the same way as previously. The downside is, that once again you are at risk of colliding with other elements on the page, should they use the same variable names as you. 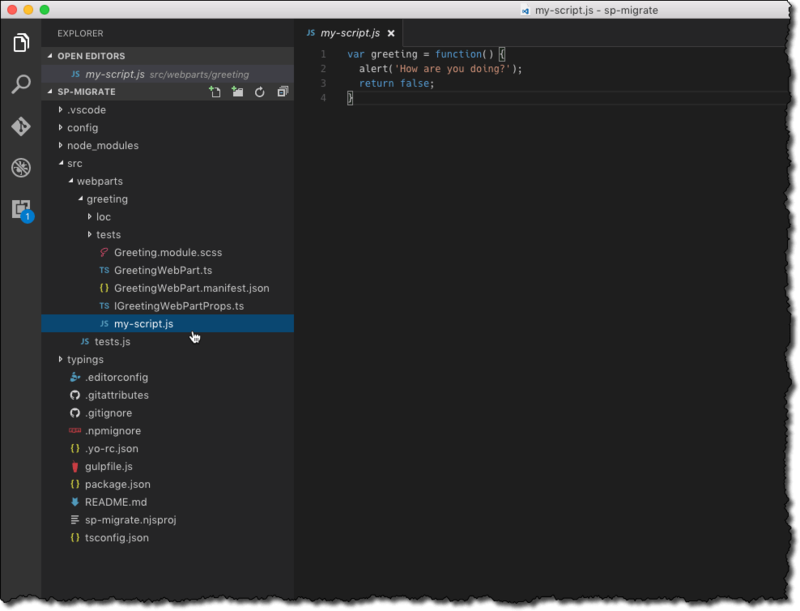 To the end you add the module.exports statement with an object containing the different elements of your script that should be available outside of this script – think public members of a class. First of all, the require statement is changed to an assignment. That way you get the reference to all exported pieces of your script, which you need later on when defining the event handler for the button click event. Next the click event handler, previously defined using the onclick attribute on the button, is removed. Instead, you retrieve the reference to the button using the querySelector function. Once you have it, you use the addEventListener function to assign the exported greeting function as a handler of the click event. 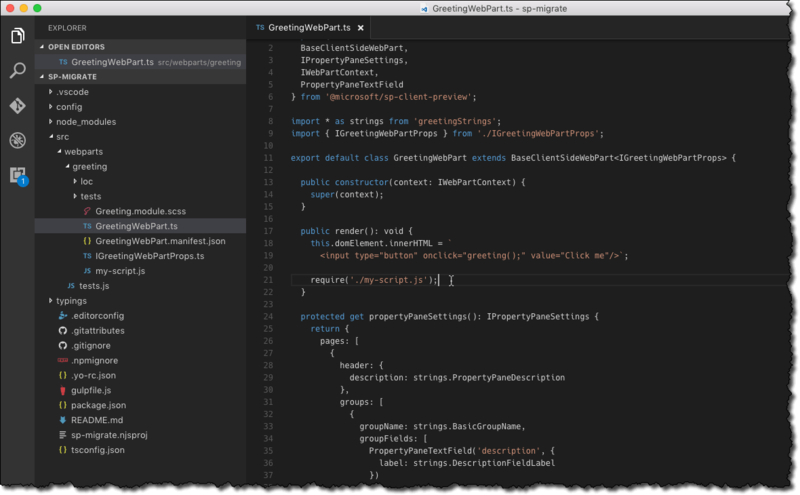 This approach is great because it doesn’t require you to rewrite all your code to TypeScript and yet allows you to benefit of the modules construct used in SharePoint Framework client-side web parts. By following this pattern you keep your code encapsulated inside the web part and have no risk of colliding with other elements on the page. 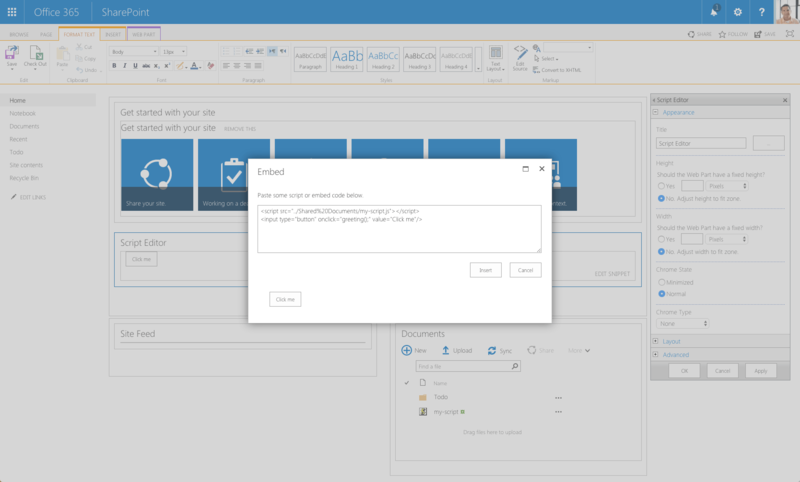 When migrating SharePoint customizations built with Content or Script Editor Web Parts to SharePoint Framework there are a number of things you have to keep in mind. 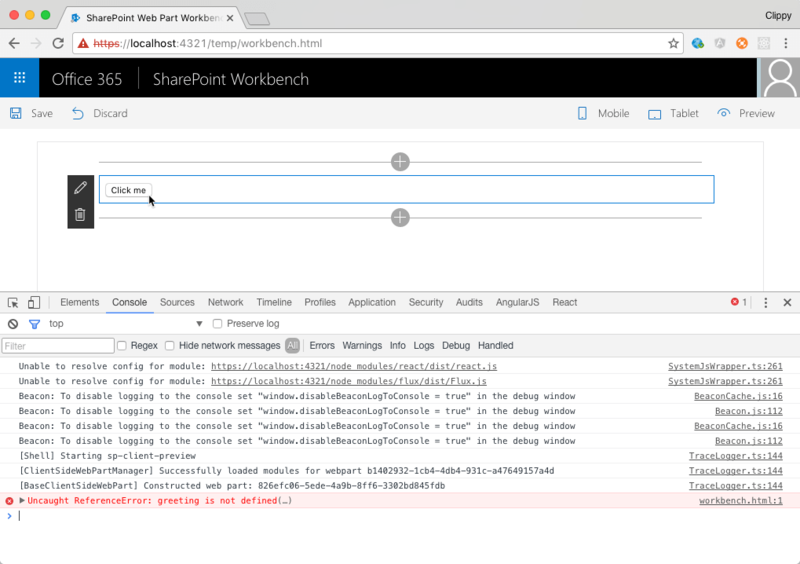 One of them is how the SharePoint Framework deals with script files included in the web part and how it encapsulates them inside the generated bundle. 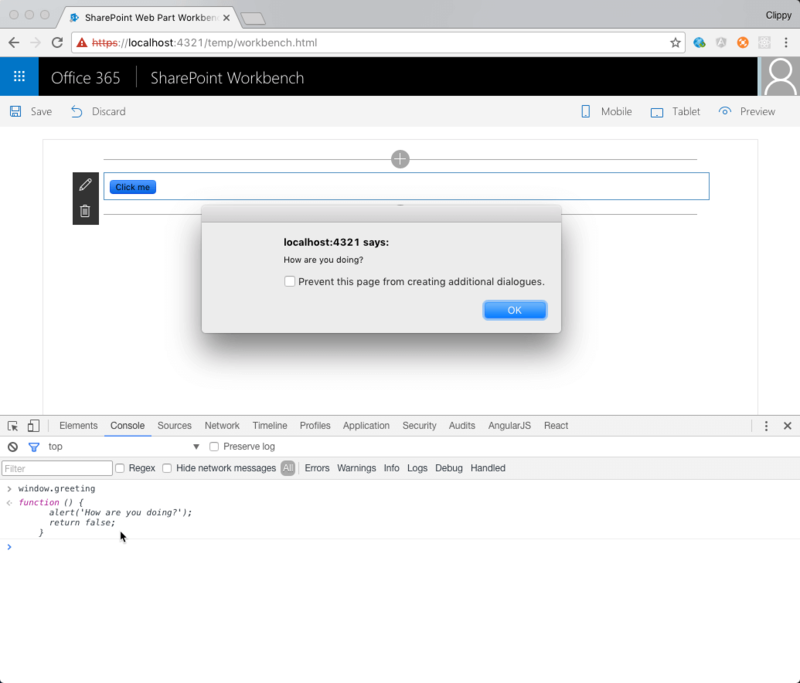 With a little change to the script code you can use the existing script files with SharePoint Framework without having to completely rewrite them. This blog post has been originally published on Waldek’s blog.